Last night Cadillac showed images of its first-ever electric vehicle, a sleek crossover, though its name and any real details have yet to be revealed. One thing that was very much revealed, though, was the new Cadillac logo glowing proudly on the nose of the car. This logo is the first major update to the famous Cadillac shield since 2013, when it abandoned the traditional laurel wreath. Let’s scrutinize it a bit. Cadillac’s badge has always been based on a somewhat fictional coat of arms for Le Sieur Antoine De La Mothe Cadillac, the man who founded Detroit in 1701. Over the years, the logo has changed its aspect ratio many times, growing wider and narrower from year to year, and has progressively gotten more and more simplified, first losing the interior details (including those birds, which are martins, not ducks) and then, finally, that wreath. It’s modern, dimensional, and colorful. There’s distinct textures in the various compartments, and while it’s very simplified from earlier iterations, it’s still a relatively complex logo. The version used on the still-unnamed EV, though, represents the most dramatic simplification of the logo we’ve seen yet from Cadillac. Clearly, this references the fact that it’s an EV, and as such is likely packed full of electronic circuit boards with traces. The key elements retained when the logo gets highly simplified seem to be the mirror image of the logo as we normally see it. Was there some intentional reason for this? It’s not clear at all if this new logo design is just for this one concept, or if it’s an actual attempt to re-work Cadillac’s whole brand identity. 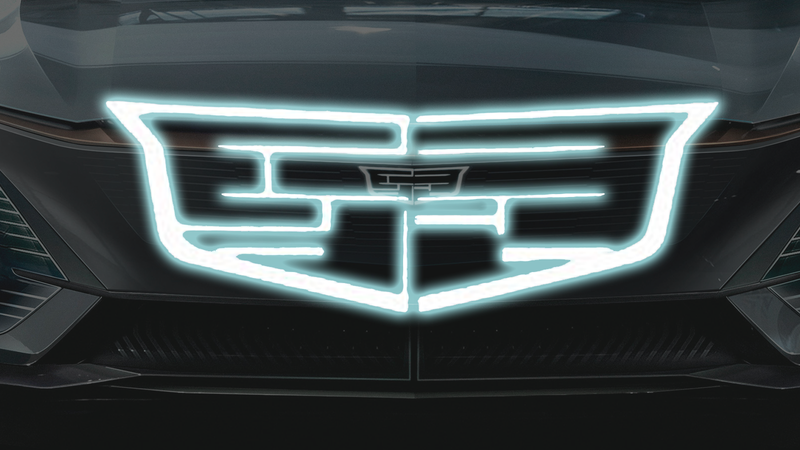 At this point, I suspect it’s just for this concept, but, if Cadillac is actually going to become GM’s primary electric car brand, perhaps a logo like this actually makes sense.